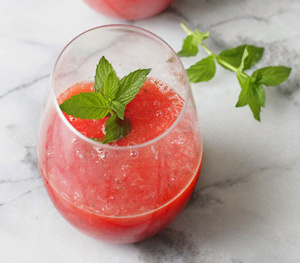 Lime, Mint & Watermelon Punch (Non Alcoholic) - What About Watermelon? 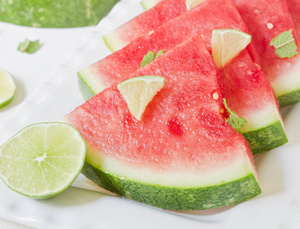 This refreshing non alcoholic punch is a delicious mix of lime, mint and watermelon. Perfect for hot summer days by the pool. 15 minutes plus time for chilling. In a saucepan on medium heat, combine water and sugar. Stir over heat until all sugar crystals have completely dissolved. Cut up your watermelon into pieces appropriate for a blender jug. Place watermelon pieces into blender jug (they may not all fit at once) and pulse until a smooth puree is formed. Add in extra pieces and repeat if all your watermelon did not fit at once. Measure out five cups worth of watermelon puree from blender and pour into a bowl. Place bowl in refrigerator for two hours. Juice limes using a hand held juicer. Combine mint and lime in bowl. 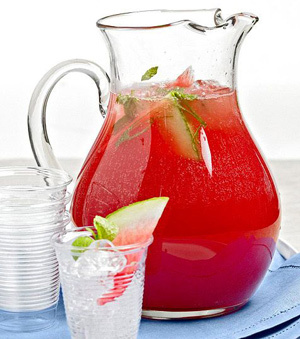 In a punch jug add watermelon puree and lime mixture using a spoon. Add desired amount of sugar syrup so that your punch is sweet but not overly sweet. This will depend on the natural sugar content of the watermelon used. Add alcohol and ice cubes at this point if you wish to. Serve on a hot day into punch cups.